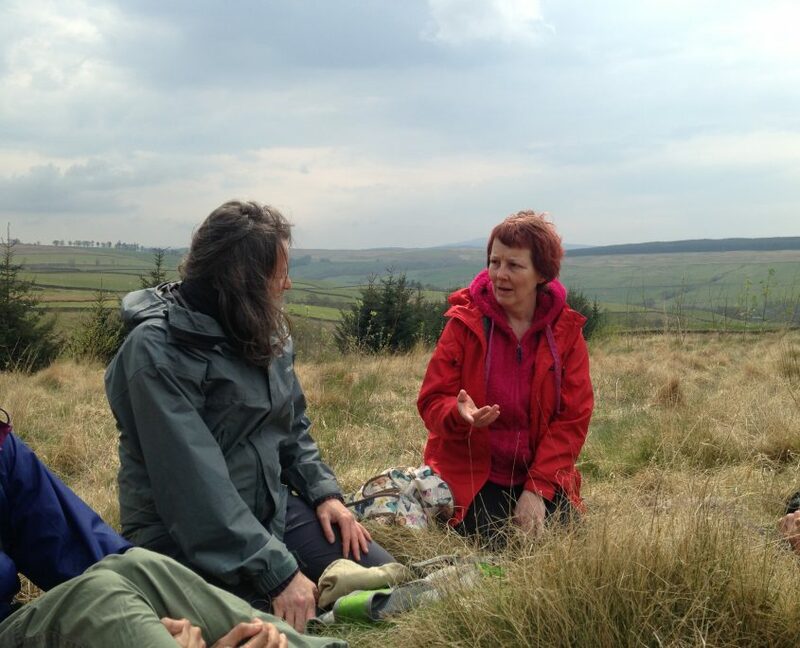 Due to an unfortunate accident, Quest organiser Jan Hogarth, was unable to attend. Jan knows the links with the Merlin history and hoped to connect this with the ecology and foraging. The walk was repositioned to explore foraging within the context of this environment, and for this our facilitator was ecologist and Borders Trust coordinator, Ali Murfitt. Under the sound of heavy rain pelting down on the barn roof, we made our introductions with each other as a group. 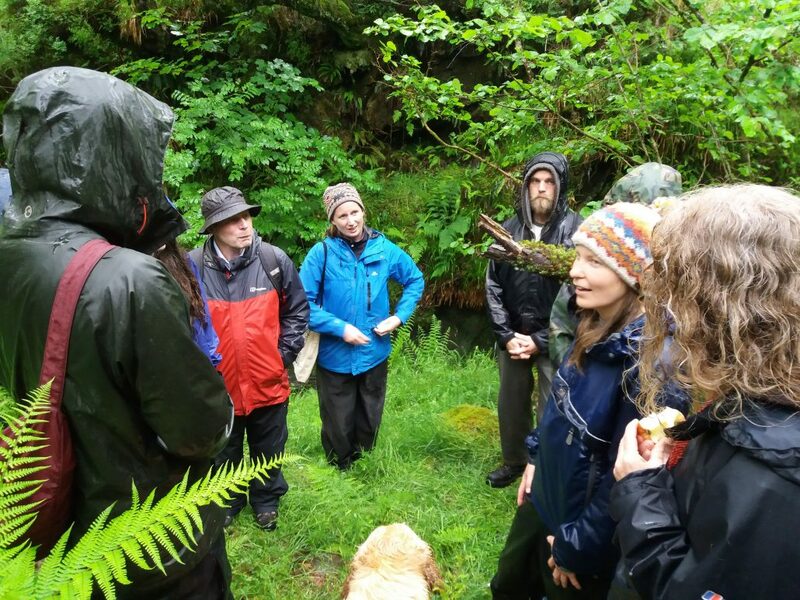 We were a composite of colourful variety: botanists, students and educators; a storyteller and a woodsman- each with a different level of foraging experience, but all united in the quest to discover more about the edibility of this landscape. With a scattering of Merlin inspirations and knowledge spread across the group, we resolved to allude to the magical one wherever possible. 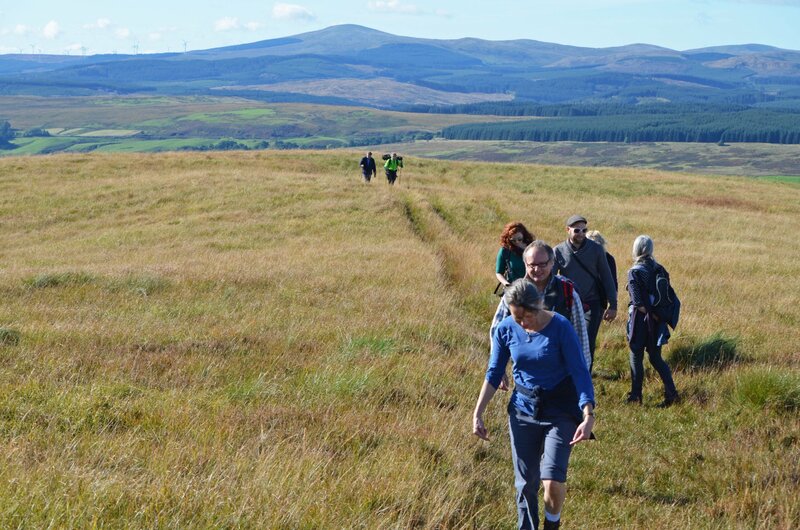 Through Ali’s introduction, the landscape which we were to explore was placed within the context of it’s relationship with Borders Trust. 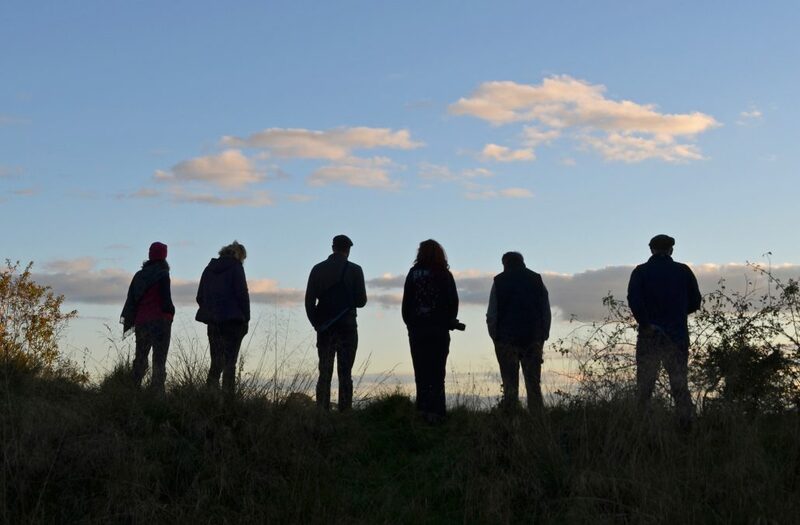 Corehead Farm was bought by the trust in 2009, with the vision for a community-engaged, sustainable project integrating restoration of native woodlands, wetlands and heathlands with a farm operating on organic principles. 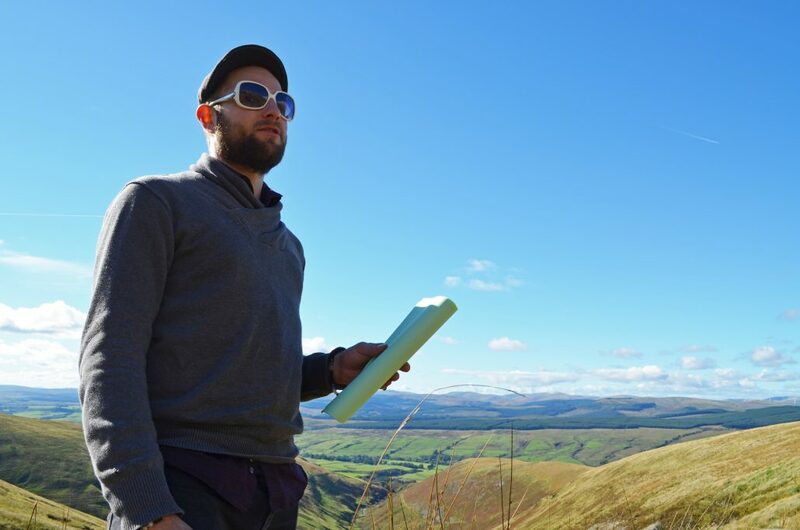 Ali admitted that it was at times difficult to reconcile these distinct needs of habitat restoration and sheep farming, yet- if successful- the unlikely marriage of the two could provide a way forward in re-imagining land use within the Scottish uplands. Suddenly the rain stopped and so, seizing the window of opportunity, our group bounded out into the landscape, heading east- towards a valley which Ali assured us, was much more interesting than that of the iconic Devil’s Beef Tub. Heading through the farmland pasture, Ali drew our attention to the predominance of yellow rattle; a native wild flower now much in decline, which has the ecological advantage of being semi parasitic towards grasses, so opening the way for greater biodiversity within pasture. Although not edible (some sources indicate a medicinal use for treatments of the eye), the plant has been used as a dye- reminding us of the multitudinous facets of usage made possible by the plant kingdom. Although the pasture was still predominantly grass, perhaps over time the yellow rattle could create space that would allow for an increased presence of the pignuts, plantain and red clover which we found speckled throughout the pasture. Ali recommended the making of Red Clover Vinegar- made by simply infusing the flowers within apple cider vinegar in order for the clover to release it’s flavour- and calcium rich properties- into the vinegar which is then strained, in order to be used within salad dressing, or to add a dash to hot water to be enjoyed as a tonic. The pignuts brought us into relation with a legal dimension of foraging: the law states that no plant should be dug out of the ground without permission from the landowner. Whilst ultimately created in order to protect property rights, the law would also go some way towards ensuring conservation. This stimulated a group discussion surrounding the dynamic between foraging and conservation. Named pignuts for good reason, perhaps the very success of the plant was dependent to some degree on the activity of the wild boar digging up the tasty tubers. In doing so, the boars perhaps prepared the ground for the seeds to fall, and a new plant to germinate. In the absence of wild boar, perhaps human foragers can fulfil a particular function through careful selection of a site in which to forage for pignuts- or ‘fairy tatties’ as they are colloquially known as in Scotland. As a group we could also testify to the suggestion that badgers too would go for these tubers- leading to the conclusion that it would only be ethical to forage for them in areas where they grew in great abundance- in addition to having the landowners permission. Onwards and upwards, we passed through the pasture and come to a planted orchard enclosure. Planted within the realms of a protective deer fence- with wooden stiles inviting walkers into the enclosure- grows an edible hedge of blackthorn, hawthorn, crab apple, cherry and hazel, with a central cluster of young apple and plum trees. The planting was carried out by Borders Trust volunteers and junior rangers, and will grow to become a delightful edible enclave within the landscape. 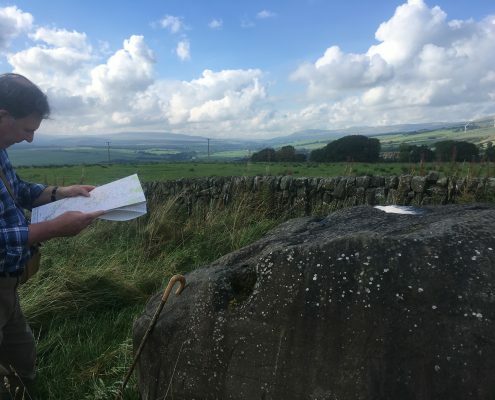 Ali drew our attention to the highest point of the hill, The Skirtle, and directed our gaze to the scattering of wooden boxes, each protecting a planted oak tree. It became apparent that the Borders Trust is planning the restoration of this habitat with a long term vision. 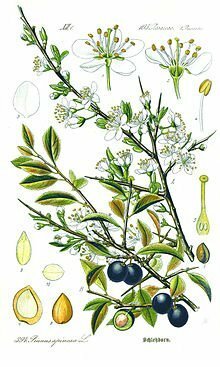 Through the gushing ford and up and over high ground pasture: grasses interspersed with heath bedstraw, tormentil and phagnum moss; the medicinal properties of each were discussed, but a meal they will not provide. Taking shelter under the tree line, we skimmed past the boundary of a small patch of woodland that includes spruce and pine trees, the new tips of which are packed with vitamin C and make a great tea (careful ID needed to avoid poisonous yew & lodgepole pine). We came to a rowan tree and took pause to reflect upon the plentiful lore surrounding this tree. With the wide spread belief that it is unlucky to fell a rowan- and the ubiquity of rowan trees being planted outside a homestead, Ali encouraged us to ponder upon the link between these superstitions and protection of particular species- what better way of a tree being protected than by a belief that it is unlucky to cut it down! We compared notes of the edibility of the berries- the making of rowan jelly to be served with game is widely known, but the berries can also be enjoyable (if a little tart!) 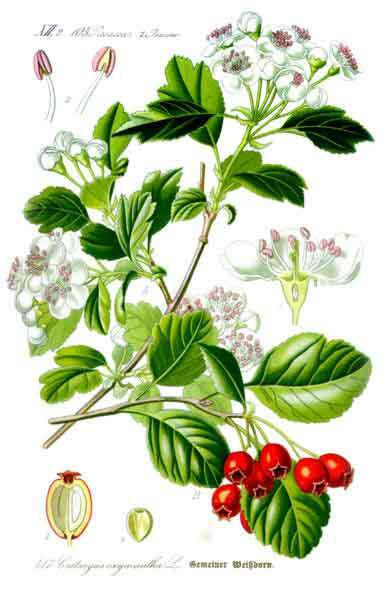 as simple compote made by stewing the rowan berries along with other autumnal fruits such as hawthorn and rosehips (removing the hairs first). We roamed on, entering the main area which has been replanted by Borders Trust. Suddenly the sightline changed: we were surrounded by the short but luscious growth of newly planted alder, birch and hazel. Over the past 8 years, the Trust have planted thousands of trees and the effects are already apparent. An increase in biodiversity is noticeable as our feet push through swathes of sorrel, meadowsweet, foxglove and lousewort. We paused to nibble a succulent leaf of common sorrel, the sour tang providing pleasant refreshment. Ali’s excitement was palpable as she led us down the sloping side of the valley- heading into what she has described as a fragment of the original woodland which once prevailed on this hillside. Dipping down a steep muddy bank, hanging onto the generous limbs of an enormous ash tree for support, we were transported to a different world where the group reassembled on a level outcrop overlooking a small waterfall. 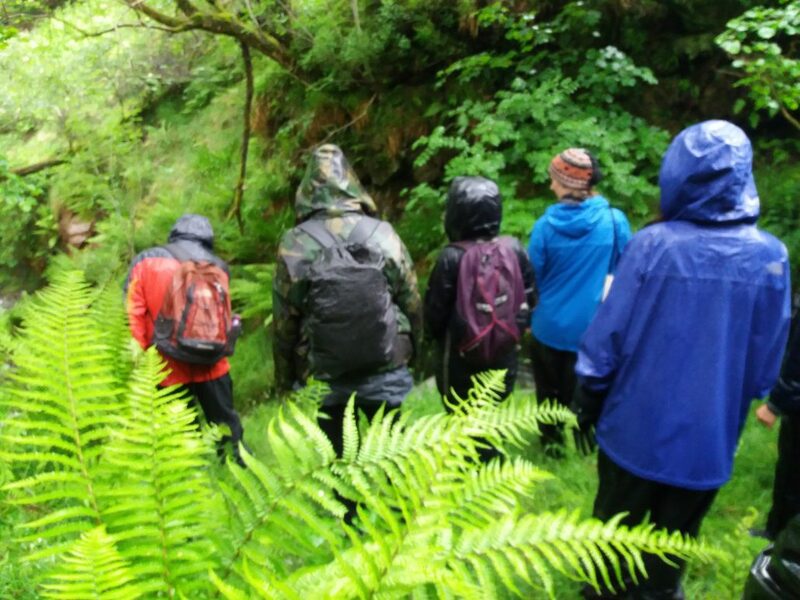 The canopy layer above us was thick with leaf patterns of great diversity, the sound of fast flowing water surrounded us as the Tweedhope Burn traced its way in a curvaceous gush down the glen. Swallows darted upstream into shafts of sunlight that shone luminous through the multiple levels of greenery. Beside us was a mighty hawthorn in full bloom with a richly perfumed scent promising a full fruiting to come. Beyond it stood numerous hazel trees- the ancient Celtic tree of wisdom, offering indication of the sustenance that a feral wanderer such as Merlin must have depended upon. We stood quietly for a moment, immersed in the atmosphere of this precious fragment of ancient woodland. Then we reached for our lunch boxes to meet our own immediate needs for sustenance. For now, these hills may not be able to support the dietary needs of our group, but it is apparent that through the vision of Borders Trust, restoration of this hillside will gradually lead to increased biodiversity- with the fortuitous side effect of a greater abundance of edible and medicinal species. Leaving the ancient woodland behind us, we retraced our path down the hill- this timing pausing at the ridged remains of the Iron Age settlement, Broad Tae. It is a humble reminder that these hills once supported not only the foragings of Merlin, but once supported a whole population who presumably effectively combined farming alongside the gathering and utilisation of wild plants and herbs. As we walked back past the planted orchard, through the meadow and back to the farm, I looked behind us to the replanted hill from which we came. With time, those contrasting sections of planted hillside and the remaining fragments of ancient woodland will merge and enmesh together to become one continuous restored habitat: a magic of which Merlin would surely support. 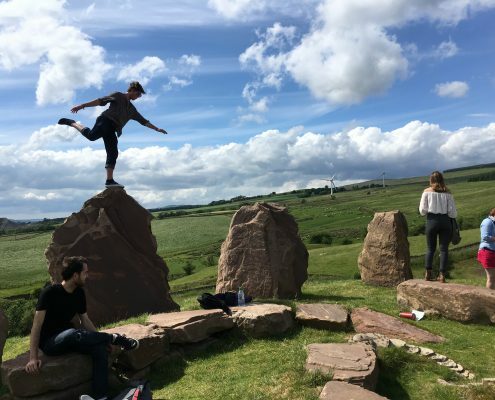 Thanks to Amy Clarkson for writing this Blog – Amy is a Glasgow University student of the Mlitt Environment, Culture and Communication postgraduate course which is taught at the Dumfries campus. 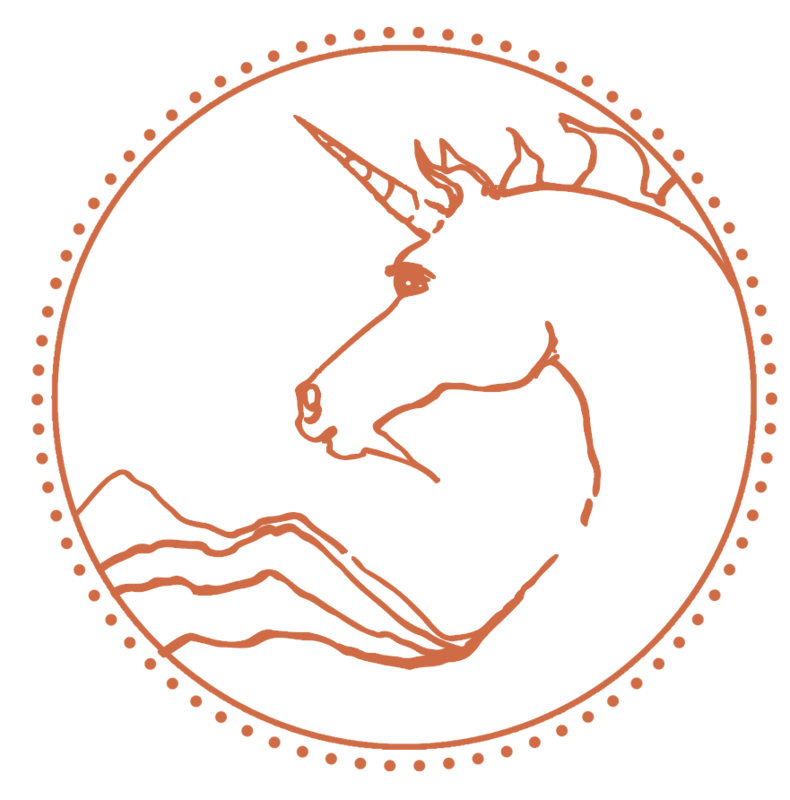 http://questsandretreats.com/wp-content/uploads/2017/07/20170611_142058.jpg 3096 4128 editor http://questsandretreats.com/wp-content/uploads/2016/03/Unicorn-circle-v4-alt-e1456865393378.png editor2017-07-26 11:24:042017-07-31 10:01:36Merlin Wild Foraging Quest - A great day out in the rain! 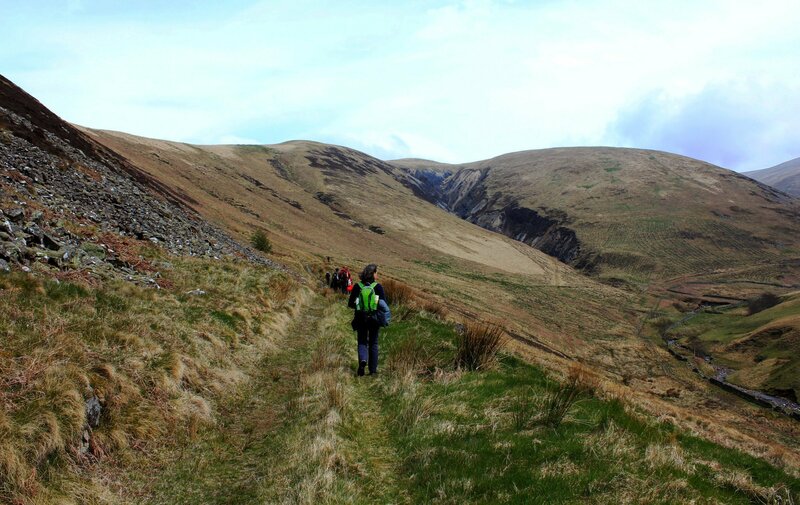 Ascending Hartfell with Queensberry hill in the distance. This quest was a return trip for some, like our fearless leaders: Justin K Prim, an upcoming Merlin scholar, and Jan Hogarth, a landscape artist. For others, it was our first time hearing the legends and standing in the places where they are believed to have occurred. When I met Jan that morning, she welcomed me with her message: the story is rooted in the landscape, so it takes on new meaning when we explore the legends while in the landscape. The story was of Merlin. This was not the wand-waving Merlin supporting the legendary King Arthur that I had grown up with. This landscape told the story of a tribal leader’s bard named Myrddin. He may be credited with shamanic or druidic magic in some sources or hailed as a prophet in others, but this Merlin felt much more corporeal than the magician caricature presented in many modern retellings of the legends. 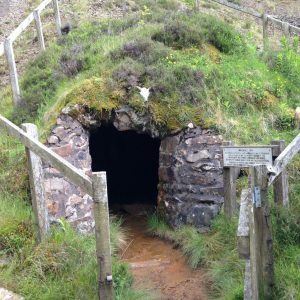 His was the story of a simple man fleeing into the wild forests in the hills of Southern Scotland, ‘driven mad with grief’ or maybe PTSD, and seeking sanctuary from his trauma and the enemies pursuing him. As with any legend it was a quest of imagination, but I think it was easier to picture this man running from his suffering with the grasses of the hills beneath our boots and the breeze on our faces. 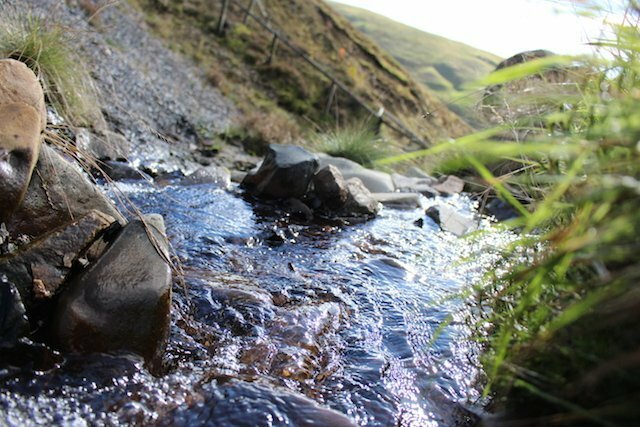 Our quest group met up in Moffat, the spa town that blossomed due to the healing waters of the well we were seeking: the spring on Hartfell Ridge. Together we crossed the hills that are divided up into farm plots for sheep and deer to graze. Our first real pause was by a row of evergreens. There Justin read his first selection to us. He shared some poetry that tells the story of Merlin wandering in the forests, searching for food, struggling to survive, and running from the King of Strathclyde. It’s not difficult to imagine the rolling green hills covered in forests. However, it is jarring to remember that even these green and brown hills covered in growth and life are so fundamentally different now because of human impact. The forests in Merlin’s time, just before 600 C.E., would have blanketed the entire area apart from the very tops of the hills, according to the poems around a century old. One of our scientific questers tells us that this is because the ground at the top of the hills would have been too wet and boggy for trees to be supported. Now the hills are adorned primarily by long grasses, although seedling trees remind us that it may change yet again. Justin recites Myrddin poetry from the Black Book of Carmarthen. Our journey to the top of the hill is punctuated by these pauses. We stop to catch our breath. We stop to drink water or take off a sweatshirt, but mostly we pause to listen and discuss. Justin reads to us, telling the story of Merlin’s journey over the same ground. Our discussions have an emphasis on this man, but also an emphasis on humanity in general. We talk about how climate change is changing these hills. We discuss the accuracy of these stories that were only written down at least 500 years after the stories were to have taken place. How much were they changed by the people who passed them on? How much came from the monk scholars who finally recorded these stories? We ate our lunch sitting on the hill above the valley where the water rushes up out of the earth and turns into a river. Together we pondered the allure of nature, whether truly wild or a manicured nature like this one. Nature is a solace for us, a place to go in a time of struggle. We could all share stories of being hurt or shocked by life and finding refuge in the arms of mother earth, just like Merlin did when he fled in grief. Nature holds wisdom for people to seek out in times of struggle. A guru lives isolated on the mountainside. The Buddha found Enlightenment while meditating under a tree. It is a common thread wound through society. A troubled person can leave man-made order behind and seek the life of nature. The seeker returns to their with a sense of peace or new meaning. Merlin was seeking solace for his pain. Today we were seeking Merlin. We made our way down the hill and into that valley. 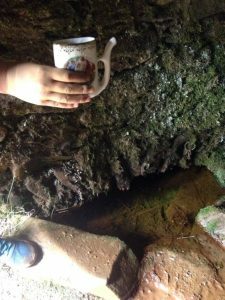 Following the path of many pilgrims looking for the healing waters of a chalybeate well, naturally rich in iron and calcium to heal their various maladies. Here we listen to the end of Merlin’s story. He has wandered for 50 years in these woods, tormented by poor mental health and paranoid of being taken prisoner. He was known as a prophet having visions primarily of death and war. Was it predicting the future or were they flashbacks? Poor, tortured Merlin drinks from the Hartfell Well and is miraculously cured. Jan Hogarth talking about the healing spring from the chalybeate well. The story says, his mind returns to him then and despite being offered places in court, Merlin resolves to remain in the environment that has sheltered him for the past 50 years. There is nothing for him in the castles of civilization anymore. Maybe that is the true message that we search for in nature, how to give up the conveniences of modern life and live immersed in the natural world. If it is, we haven’t reached that point yet. Instead we return after drinking from the spring together. Our story in the landscape ends where Merlin’s began. 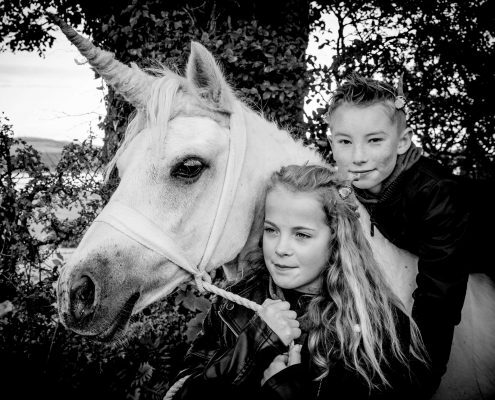 We make a short drive over to Longtown, just over the border of England. Hidden away in more fields is the remains of a fort. All that is left are the hills, built up as embankments to add an extra layer of protection for the fort defenders. The defensive nature of the structure is easy to see, and through the trees to the north, you can just make out the hills we had climbed earlier in the day with a river connecting the two landscapes. Entering the woods close to the fort at the site of the battle of Arfderydd. Merlin Academics believe that this was the location of the Battle of Arfderydd. We look to the south with the Cumbrian hills in the distance and imagine the armies of the King of Strathclyde spread out across the fields between us in 573 C.E. Here the bard, Myrddin or Merlin, watched his Lord Gwenddoleu die with many of his closest comrades. It was from here that he fled after the long and bloody battle and after three days of mourning for his fallen. Fort at the site of the Battle of Arfderydd where Lord Gwenddoleu and Myrddin resided. We imagine even more. Could his madness be from more than just grief or PTSD? Could it be survivor’s guilt? 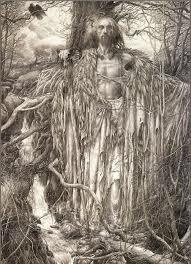 If Myrddin were a shaman rather than a bard, could it have been his duty to raise the druidic mist to protect the army during battle? If that failed could guilt over not protecting those who died have caused him to go mad? We can let our imaginations run free here, at the place where Merlin’s journey into the hills began. People have a connection to the land they live on, whether it’s a land mostly untouched by human hands or if it’s built up into towns, cities, or skyscrapers. The land we live on shapes our lives, and I think most people would agree that the natural landscape invigorates us. On this quest we came together to travel over the hills. Through our imaginations we could travel even further, through time and into legend, each of us returning with something special and a day to remember. Battle of Arfderydd, the root cause of Merlin’s madness? 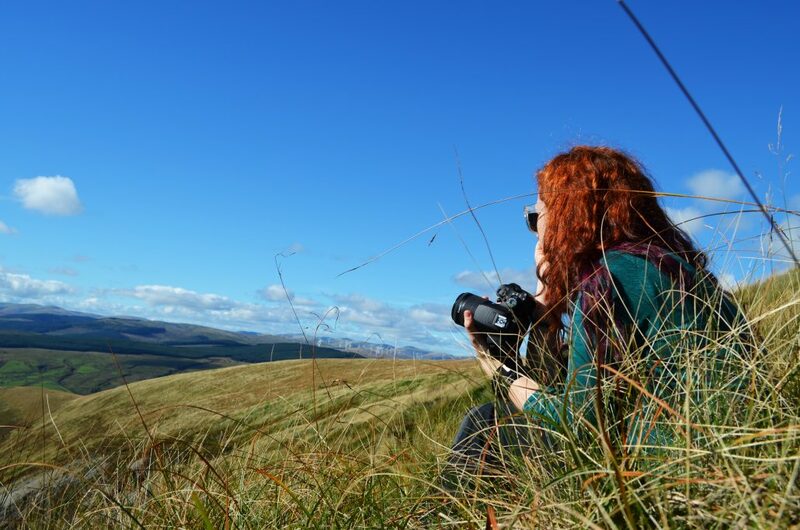 Laura Schrader is from the United States and is studying for an MLit in Environment, Culture and Communication at the University of Glasgow’s Crichton Campus in Dumfries. A big thanks to artist Katie Anderson for the stunning images. The signboard that greeted our group under clear blue skies in Moffat on May 7th located just a few metres before the Annandale Water Hall set the tone and pace for our quest. Akin to the winds that carried the word, ‘Hartfell Spa’ on the isolated road, we echoed each other’s names against the backdrop of this Border landscape. This exercise wasn’t merely a genial induction held between 9 individuals. Instead, it marked an immediate space of inclusivity and attentiveness to each other and our surroundings. 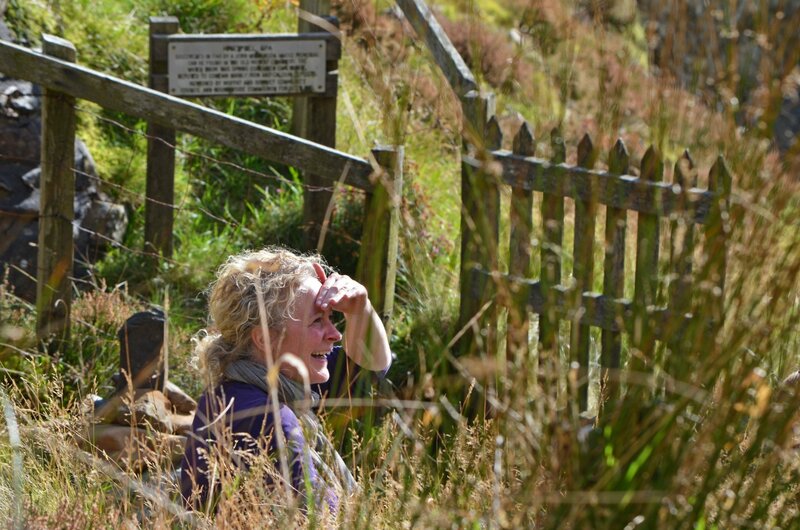 Place names like our own, after all, are imbued with meaning, stories and memories. 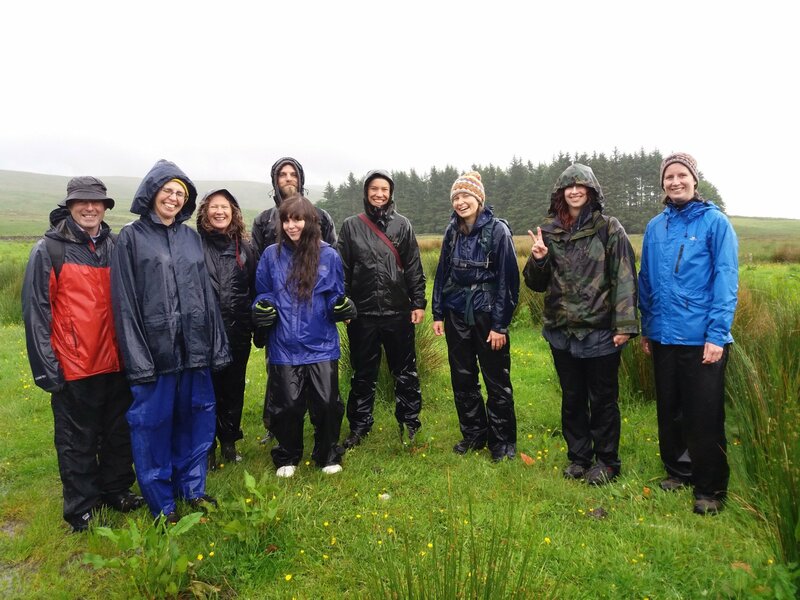 Indeed, this was a fitting introduction to the retreat guided by Environmental Artist, Jan Hogarth and Folklore Expert and Scottish Ethnologist, Dougie Strang to find the healing water of Hartfell Spa. 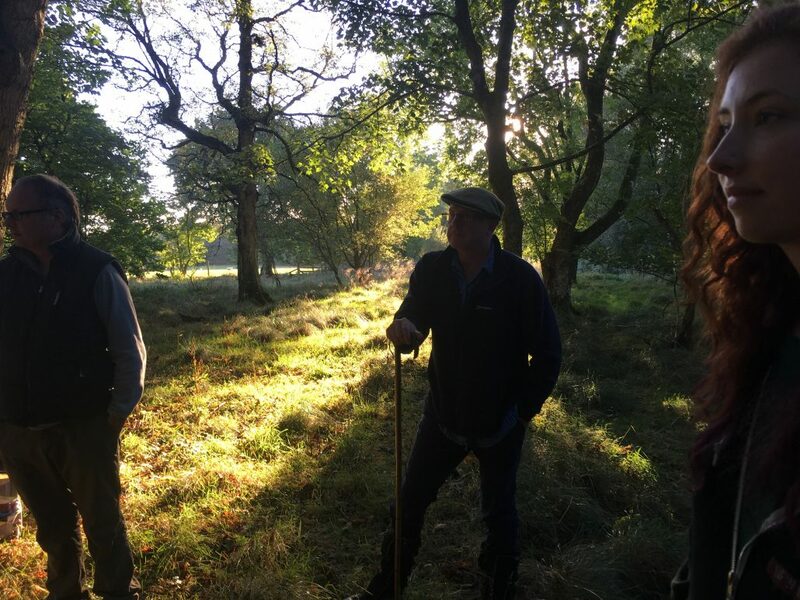 Dougie Strang, folklore expert and performers shares with us the secrets of Hartfell Dougie Strang, folklore expert and performers shares with us the secrets of Hartfell, the folklore of the landscape and reminded us of our ancient relationship to nature. River Annan – In Irish mythology, Anu (or Ana) is the name of a goddess or great mother. 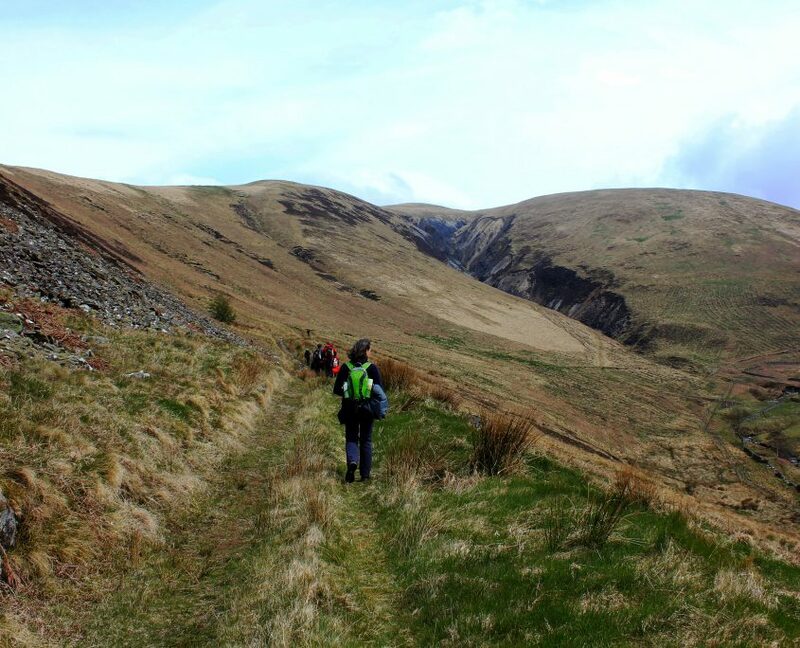 As we began our walk towards Hartfell, the highest hill in Dumfriesshire, we were informed that the gradation of space is not only defined by height. Culture and nature too, have stitched their enigmatic cloak across the landscape. 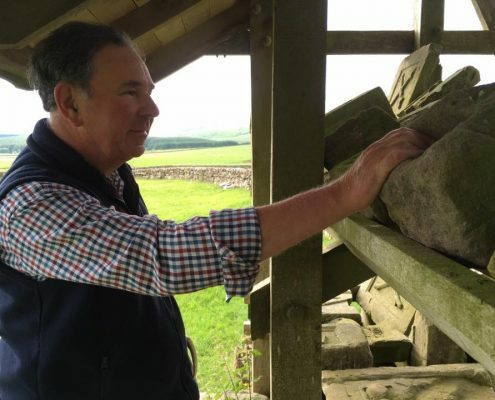 Through Dougie’s engaging stories, together we unearthed Hartfell’s contours that have been carved by history, mythology and imagination throughout the centuries. 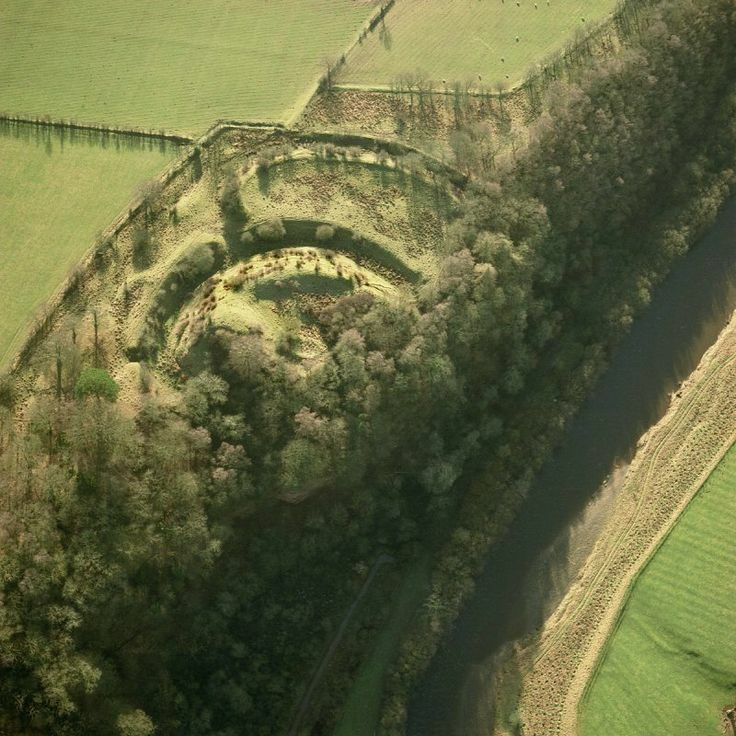 The junction of 3 rivers (Clyde, Tweed and Annan) can be found on these hills which were also the abode of Neolithic dwellers, the Frisians and Celts. Perhaps, its most famous resident is the sixth century figure, the Wizard Merlin, who was believed to have spent his last years of exile in the wild forests of these Southern slopes. We climbed higher on a grassy track and were asked to converge at the spring in silence. It was not just in sight that we approached the waters as all of our senses were magnified and the path demarcated our own zones of intimacy. Each step towards the Spa was connecting us to our presence at the hills while disconnecting us from the hustle and bustle of our lives. From ancient seers to the sickly, those who made their journey to the Spa were most likely guided by both external and internal compasses. We too, were pilgrims that day; our bearings shifting to what each of us were seeking for in the sojourn. We followed the gully and stream that brought us to the Spa and the quest culminated in the drinking of the water. One by one we entered through a small arch that led into a stone cellar. The wooden fence creaked as we had to bend low into the vaults. It is thought that Hartfell is an entry into the other world and this gesture at the Spa was somehow symbolic of the intersection between the tangible and intangible, the physical and the spirit. Soon, the rising wind was our receptive company and it could be appreciated why the Spa was a main source of spiritual wellbeing and inspiration for so many before us. Jan Hogarth explaining the history of the Spa. Hartfell spa was discovered in 1748 by a John Williamson, whose memorial can be found in the old Moffat cemetery. 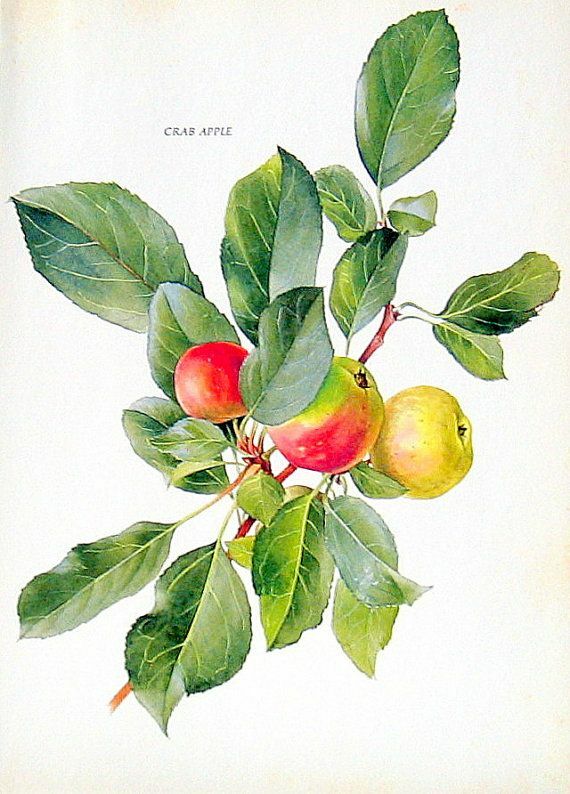 It was considered into Victorian times and in some cases, even today as having healing powers. “I thoroughly enjoyed our quest. I am still processing my experience. I enjoyed connecting with the land, the ever changing terrain and energy, the views and character of the water that flowed through the valley and trickled off the hills. Witnessing and sensing nature from so many perspectives, ancient nature, newness of saplings, the here and now in an instant of flowing water, nature’s embrace as I experienced the comfort and warmth of sitting in the grass. The engagement of the animals; the deer, the birds, the sheep and the poppy and penny too! What stood out for me is despite being in love with nature I tripped myself up by believing I was more connected than I truly was. The moment of realisation came in the well, when silly me drank out of the muddy puddles on the well floor. Only when I turned around to leave did I spot the well the natural spring water! After having lunch nearby the Spa, we headed down with a partner and exchanged stories of connection to nature, place and life. 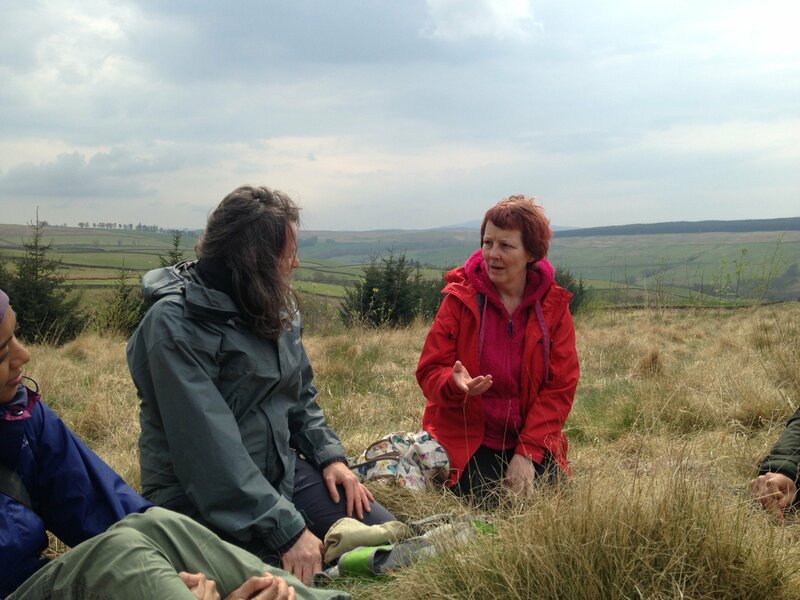 Later on the grass and heather, we shared our personal reflections. The Hartfell Spa was a conduit for these experiences as it was markedly a pensive occasion, fueled and nurtured by the 3-hour walk to the Spa. 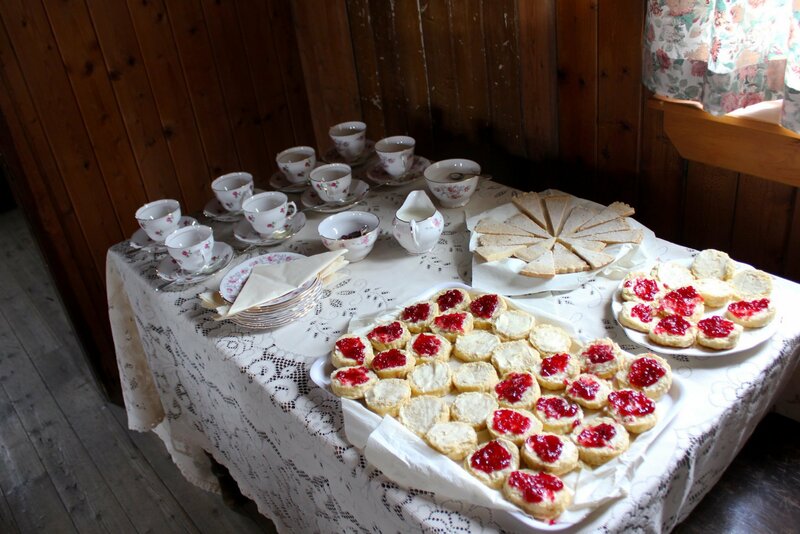 The retreat concluded at the Annandale Water Hall with afternoon tea. These treats weren’t the only things that nourished us at the end of the journey. 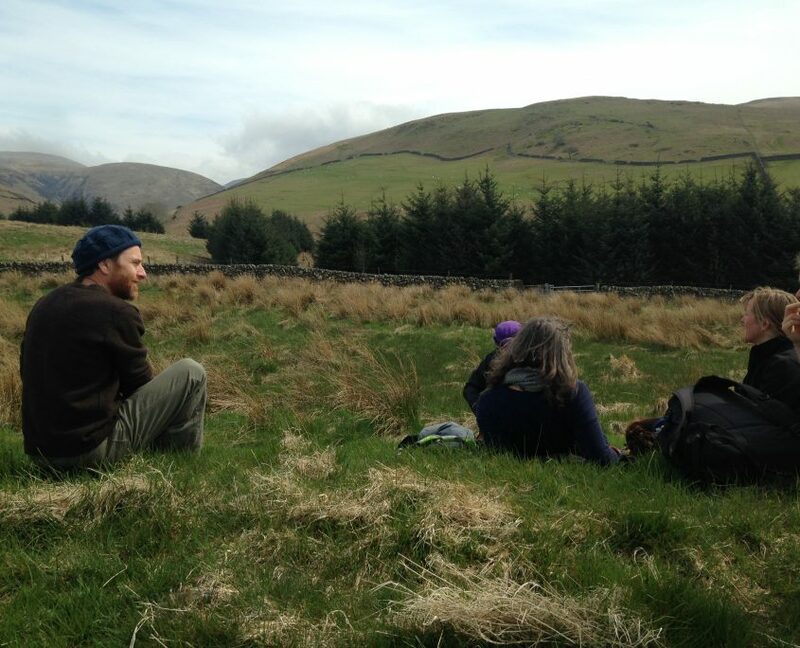 With our spirits refreshed, the encounters and connections we experienced – with fellow Quest participants, the landscape, folklore and stories of Hartfell will continue to be signatures that rest on us as we return to our daily routines. 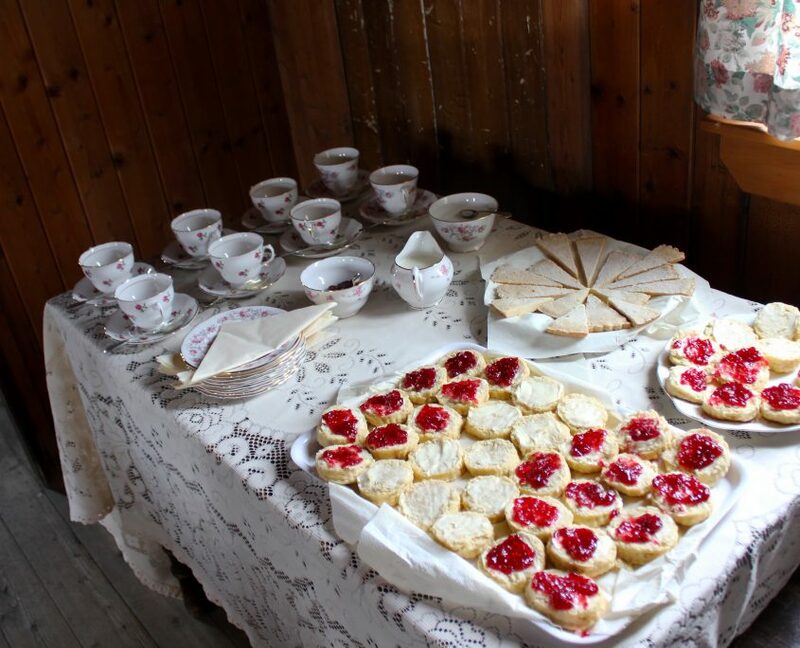 “Cosmic speculation in good company, beautiful surroundings, rounded off by excellent scones!” – Will Marshall, Quest participant. Nadiah is a postgraduate student of Environment, Culture and Communication at University of Glasgow, with a wide experience of conservation, including working as a Marine Communications Officer with WWF-Malaysia, an Environmental journalist with the Malaysian News Agency and a Programme Development Coordinator with APE Malaysia, a social enterprise working on improving captive wildlife welfare in the South East Asian region.